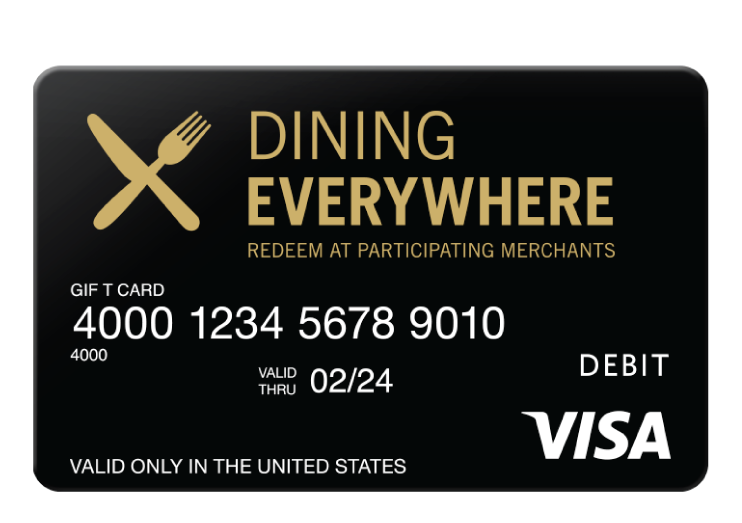 From fine dining to food trucks, eat and drink at your regional culinary favorites everywhere Visa debit is accepted. How do I use my Visa Gift Dining Everywhere Gift Card? Your Card can be used to purchase food and drink at restaurants and bars everywhere in the US where Visa debit cards are accepted. Some restaurants may factor in an additional 20% (or more) to cover gratuity. In this situation, if the total amount of your bill plus 20% exceeds the amount available on your Card, it will be declined. For example: If the total bill for your meal is $80, a balance of at least $96 is required on the card ($80 + 20% = $96). You still get to decide how much to tip your waiter, and only the amount you spend is deducted from your account. The total amount of every purchase you make will automatically be deducted from the value on the Card. You must register your Card to use it online. Your Card is not redeemable for cash, except as required by law. It cannot be used at ATMs, for gambling, or at merchants requiring a manual card imprint. Additional restrictions may apply. 1. Protect your money. If your Card is lost or stolen, you can request a new card by calling 1 (877) 341-5484. 2. Make online, mail or telephone purchases. Online, mail and telephone order merchants often require that personal information, including name, address, telephone number and email address of the cardholder be verified with the card-issuing bank prior to purchase. Unless you register your Card in advance, there may be no way an online, mail or telephone order merchant can confirm your identity. Without such confirmation, the merchant might decline your purchase even if there are sufficient funds on the Card. If you wish to dispute a transaction on your card account, you should always first try to resolve your dispute with the merchant. If that doesn't work, please go to www.diningeverywheregift.com/dispute for more information.